Chasing bad guys or climbing through burning buildings takes more than adrenaline. It takes strength and endurance. Learn what physical fitness tests you have to pass to serve. Those who serve their communities by signing up with civil service agencies are tasked with saving lives. In doing so, they must sometimes place their own lives at risk. Most of us—throughout our days in swivel chairs in front of computers—don't have much to worry about besides a little back pain or eye irritation. However, the tasks required of the police force, firefighters and other civil service members require intense physical effort. Your life may depend on it one day. To perform these difficult physical tasks, most agencies require a certain level of physical fitness before they hire a new person. Makes sense, right? So recruits have to complete a series of physical tests. But because the waistlines in our country are growing ever larger, fewer police and fire recruits are able to pass the fitness tests. It is time for a nationwide 911 call! Think you have what it takes? Let's find out! There is no consistent standard across the country; each force has its own requirements. Generally speaking, most fitness assessments for police recruits include a combination of sit-ups, push-ups, and a mile run; others will add speed, agility and jumping tests. Some states even include bench press and pull-up standards. 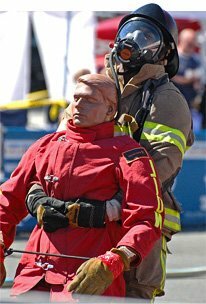 The majority of fire departments in this country use the Candidate Physical Ability Test (CPAT) to measure prospective candidates. This test of job-related functions comprises eight exercise drills done one after the other in less than 10 minutes and 20 seconds. During the test, candidates wear a 50-pound vest to simulate wearing the self-contained breathing apparatus. Recruits must climb 60 steps in 3 minutes with two 12.5-pound weights on their shoulders. 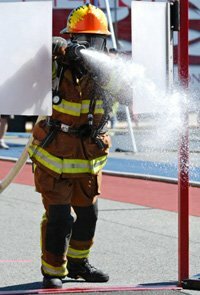 The candidate places the end of a 200-foot hose on his/her shoulders and drags it 75 feet around a barrier, making a 90-degree turn, and then dragging it another 25 feet to a 5 x 7 foot box. On one or two knees, the candidate pulls the hose 150 feet. Candidates must remove two saws from a cabinet and then place them one at a time on the ground. Then they must carry the saws 75 feet, around a barrier and back to the starting point. The candidates place the saws on the ground and return them to the cabinet one at a time. The candidate picks up a 24-foot aluminum extension ladder, and raises it, rung by rung, so it ends up against a wall. Then the candidate moves to another ladder and raises it via a pulley without leaving a 3 X 3 foot box. The candidate uses a 10-pound sledgehammer to strike a measuring device until a buzzer sounds. While hammering, the candidate must stay in a designated box. Recruits must crawl on hands and knees in a tunnel maze that is four feet wide and three feet high. The 64-foot-long tunnel has two 90-degree turns. In addition, there are two areas with significantly reduced space. The candidate grabs the handles at the shoulder of a 165-pound mannequin and drags it 35 feet, around a barrier, and then back to the starting point. The candidate uses a pike pole to push up a 60-pound hinged door three times and then use the pike pole to pull an 80-pound door downward five times. The routine is conducted for a total of five rounds. EMT standards vary more than the other two categories. 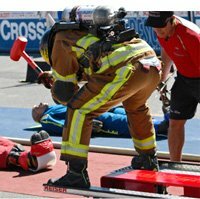 The test usually involves either a standard fitness test, like the ones used by the police and military; or a more functional test, similar to what firefighters use. Either way, the standards tend to be a bit easier than either police or fire. The focus is more emergency medical expertise than physical fitness. As you can see, standards differ. But the bottom line is that some heightened level of fitness is essential. So we came up with a series of workouts that can help any aspiring civil servant prepare for fitness tests. The workouts focus on building functional strength and athleticism. You will train six days per week. Be sure to rotate the A and B workouts each week so you don't end up doing more A workouts than B workouts.